If you need scaffolding in Horsham our team at Airo Scaffolding have a long and trusted working relationship with many home owners and construction firms in the area so you know we can be trusted. The majority of our work comes through referrals or through repeat business. We have a strong commitment to our customers and doing what we do, well. Over the years we have worked on all sizes of projects, from erecting scaffolding for individual properties to large construction projects where access to all floors and the roof are required. 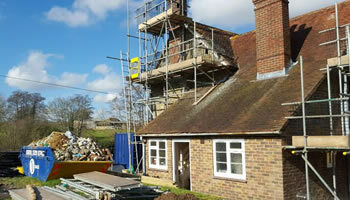 We have years of experience working in the scaffolding industry in Horsham and across West Sussex. We operate as you would expect tradesmen to - polite, courteous and thoughtful. We work around you so all you need to do is let us know the day and time that you would like the scaffold structure putting up and we will do our best to do that for you. Once your project is complete, just let us know and we will come along and take it down again for you. We always encourage making a site visit before the project starts to talk through your exact requirements including which levels you need access to and what the project is for so that we can make recommendations based on our previous experience. We provide an unrivalled scaffolding service focussing on reliability and only use top-quality scaffolding poles, boards and equipment. We also offer flexible hire periods to meet your exact needs. We have a huge stock of scaffolding and can work on any size of project for you. We offer discounts for longer term hires so if you have a large project, it's always a good idea to get in touch with us and discuss your exact requirements. We work on all types of projects including domestic / residential and industrial scaffolding. Every job, every project and every site is different so we like to come out and see the area for ourselves before providing you with a quote. It's a good chance for us to meet you and get to know what is required but also for you to meet us. We will be able to take down all of the necessary details and provide you with a quote very quickly. If you decide to go ahead, just get in touch and we will arrange a convenient time for our team to start. We operate across West Sussex so if need help with a scaffolding project in the local area, including Chichester, please get in touch.